Okay, I know, I said a little while ago that I only had one part left in shoe design, and it's still coming. I just noticed a couple things about my Kinvara's today before my run, and another at the end of my run, and I just feel a need to spout off about it. First, I noticed that there's a spot on the outside of each foot where the outer material is wearing through. I've tied them such that the last two or three eyelets are loose. I knotted the laces under the tongue loop, and have the part below that very loose. Well, there's a "skeleton" system between the upper layers (the holed-up neoprene layer and the outer material), and the forward-most portions of that skeleton are loose. On the right shoe, this is wearing through the upper at the forward edge. On the left foot, just forward of that, where the material "folds" as I run, is also wearing through. And I just passed the 180 mile mark in them today. Also, as much as I went up a half-size to get forefoot room, my little toes are still being pushed sideways by the upper. The inward sweep of the toe box happens too quickly, and while the upper is wide enough where the metatarsals end, it sweeps inward immediately, pushing my little toe into the adjacent toe. Apparently this has been an issue with every shoe I've ever worn, and I'm sick of it. 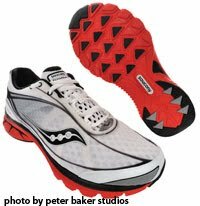 Lastly, as I was finishing up my run, I was on a road surface, and I could SWEAR I could feel the lugs from the outsole on the bottom of my foot. I checked after I finished the run, and the midsole doesn't seem overly compressed, so I'm not sure what's going on with that. 180 miles, and I'm having issues, not the least of which is the upper wearing through. I've NEVER had a shoe do that so soon.